A physical 3D model, making it possible to study the movement of a non-reactive pollutant in saturated and homogenous porous media, taking into account the contrast of density and viscosity was perfected on a laboratory scale. A sodium chloride solution was chosen as a pollutant because it enables concentration measurements using electric conductivity to be taken. Salt water was introduced in the section upstream from the porous media strata (one or two dimensional configuration). Numerical modelling was used in combination with this approach. The computer code was based on the mixed hybrid finite elements method. At first it was tested on examples found in literature (Henry’s problem and Elder’s problem) and subsequently used for the simulation of experiments carried out on the physical model. 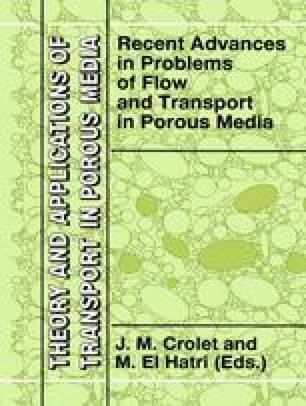 The numerical model links the equations that describe flow in saturated porous media as well as solute transport equation, taking into account density and/or viscosity. The variation of density in the mixture is assumed to be linear as a function of the concentration.